Sure why wouldn’t you jump out of a plane? Tandem Sky Dive using a dual harness the student exits the aircraft at 10,000/13,000 feet, attached to the instructor, free falls to 6000 ft!!! Parachuting is the most exciting, exhilarating and adrenaline rushing achievement!!! Why not book this as part of your Hen or Stag and make your party on to remember! Nothing more adventurous than the taking the ultimate leap before you take ‘the ultimate leap’. Make your anniversary memorable or your birthday extra special by booking you tandem jump today. It is an experience you will never forget! Don’t do it alone get all your friends, family, workmates, club or team involved in the excitement. VARIOUS DATES AVAILABLE ALL YEAR ROUND. Once your party has arrived and been welcomed to the Moonjumper centre your party experience will begin with a ground briefing covering the equipment, exiting the aircraft, freefall and landing. You will jump from 13000 feet in the air. Your freefall would be at a speed of 200 km/hr. 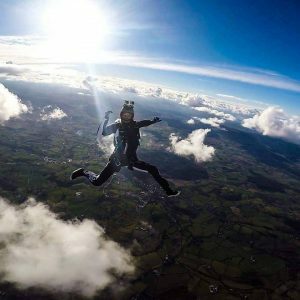 The tandem parachute jump is completely safe as the fully qualified instructors strapped to your back control the whole descent and you also receive a safety briefing session for this activity beforehand. Professional cameramen are available to capture your unforgettable moments. A video and 35mm stills are available for you on the day, this MUST be pre-booked. Boots with hooks are NOT acceptable so please don’t bring them.